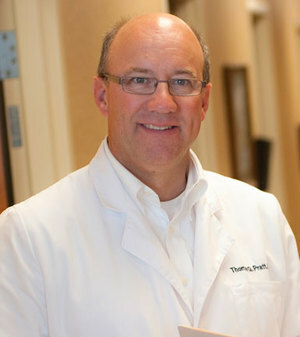 Dr. Tom Pratt has seen optometry patients at Bruening Eye Specialists since 2008. Dr. Pratt grew up in Cherokee, Iowa and graduated from Iowa State University in 1980 where he earned a Bachelor of Science degree in distributive studies with minors in chemistry, biology and business. At Iowa State he was also a four-year letterman in track and a state champion pole vaulter! Dr. Pratt received his Doctor of Optometry degree from the Illinois College of Optometry in 1985 and completed a summer residency in Chicago working with patients with glaucoma, diabetes and retinal diseases. After working in the Quad Cities, he moved to Sioux City in 1987 and began working in area optometry offices before joining Bruening Eye Specialists. Dr. Pratt and his wife, Laura, have three adult children.